I would have to suggest that over the last eighty days of writing, I’ve technically accomplished my goals – but it’s not left me entirely successful on the fiction writing front. I have managed to dedicate a minimum of 2 hours every weekday on writing – much more hours on most of those days. But it’s not gone onto my fiction work in progress (aside from a 10K marathon). I’ve spent a very long time on writing up posts for an upcoming April challenge instead. The posts are a burden at this point. But on the pro-side – the research involved has offered me a lot of knowledge which is usable in my novel, and it’s also given me at least two eureka moments resolving some storyline issues – one I didn’t even know existed. On the con side, it’s been painful writing them, from a time viewpoint, taking me away from the fiction, and because of the subject matter. Some days, it’s gotten me down. Returning to the positive side, the time away from my WIP has also allowed me to explore some other sides of me. Creative sides. I attempted my first piece of flash fiction, and picked up quickly on some other challenges. And I’ve returned very recently, to a creative outlet of mine which leaves me feeling successful and at peace with my own creativity. 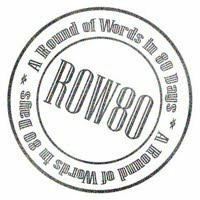 For this penultimate checkin for the first round of ROW80 2012, I am therefore setting a final brief goal. Over the next three days I simply want to be done with those blog posts. I’m stuck on three letters – X, Y and Z. Then I want to spend a few hours trying to get a handle on what posts I will do on the days for this writing blog in April. By the end of the week – specifically, Friday, I want to return to my WIP, and spend the rest of this month inside of it. I’ll let you (me) know how I’m doing on Wednesday. See what other ROWers are up to this last week via this link. Oh, you are reminding me of that A-Z Challenge I attempted last year. Maybe I’ll try again this year… oh, there is the icon in your sidebar. Wow. If I started now, I bet I could get it done…. oh, now I am itching!! Anyway, to finish on the ROW80 topic…. Completing is SUCH a big thing. Congrats for your tenacity… you are an inspiration!